Military conflict in the Eastern Ukraine draw attention to the role of the Donbas for Ukraine’s economy. The understanding of this issue is important due to strong possibility that economic links districts which are currently held by rebels (up to 3% of Ukraine’s territory excluding Crimea) are lost. Available data reveals that the region contributed significantly to Ukraine’s GDP and especially to the industrial output. Therefore, structure of economy might change if this territory is not integrated into Ukraine's economy. The trade deficit might increase, which already contributed to recent hryvnia depreciation. At the same time, the impact on public finance is likely to be balanced or positive due to traditionally high fiscal transfers to the region. Overall, the medium-terms losses will be significant but not critical and Ukraine will maintain strong industrial core. In the longer run Ukraine’s economy may become stronger and more resilient. The structure of Ukrainian economy changed over the years of independence. The share of value added generated in services increased, which is a common trend for countries, which undergo transition from planned to market economy. At the same time, share of industry dropped sharply in the first years of independence from 36% in 1990 but remained relatively high at 26% on average in 1996-2008. However, after privatisation new owners of companies in traditional industrial sectors steel, chemical and machine-building were slow to invest in their modernization and steadily lost competitiveness. As a result, during economic crisis of 2009 real value added in industry dropped by 16.7% with export oriented sectors hit the most. Industrial output never recovered and record industrial production was observed in last quarter of 2007. As a result, share of industry in gross value added declined to near 21% after 2009. The geographical distribution of economic sectors did not change over the years. Eastern oblasts of the country remained more industry-intensive than western regions primarily due to infrastructure inherited from the Soviet time. Over the years of Ukraine’s independence Donbas remained highly industrialized region with focus on coal mining and steel industry and generated on average 17% of Ukraine’s GDP in 1996-2008. It declined to near 15% after the economic crisis of 2009 s industry was not able to recover from the crisis as export-oriented industries faced weak external demand. The industrial sector of Donbas contributed on average for near 28% of total country’s value added in industry with near 40% for mining and 27% for manufacturing. Donbas supplied most of Ukraine’s coal needs (there are several coal mines in the Western Ukraine with low output and few mines across oblast line in nearby Dnipropetrovska oblast). However, the evidence shows that most mines are inefficient and ineffective due to lack of investments, restructuring and effective management. Many mines remained in the state ownership, while the most attractive were sold or leased to the company DTEK through non-transparent procedures. While talking about manufacturing, it should be said that Donbas hosts several the largest Ukrainian plants in steel industry with over 40% share in Ukraine’s output as well coking plants supplying them with coke. Chemical industry also had a large presence. These plants are predominantly export-oriented. Therefore, it is not surprising that merchandise exports of Donetska and Luhanska oblasts accounted for 26.6% of total Ukraine’s exports of goods in 2012 (with 55% for metallurgy and 31.8% for vehicles and other transport equipment). Moreover, share of exports of mineral products was at 34.6%. This figure reflected operations of Russian-owned refinery that imported crude oil and exported refined products. It stopped operations in 2013. At the same time, Ukrstat reported share of imports did not exceed 10%. This figure likely reflects imports of intermediate goods as imports of investment and consumer goods frequently goes through dealers and large traders often registered in other regions (primarily Kyiv). Natural gas from Russia is also purchased centrally by the Naftogaz and then sold to industrial customers and households in all regions. Donbas consumed 17% of gas in 2013, while gas production was minimal. After adjusting for these factors Donbas imports likely did not exceed exports (for comparison, overall Ukraine’s merchandise trade balance in 2012 was at USD 20.5 bn or 11.7% of GDP). As a result, the region created inflow of foreign currency, which was important for stability of national currency. At the same time, the Ukrstat data reveal that large share of industrial capacities in Donbas is worn out. Part of producers initiated modernisation projects before 2008 crisis and some were successful, but most exporters continued to lose competitiveness of its products on the world market. The production remained material and energy intensive, what contributed to overall low energy efficiency in the country and dependence on energy, e.g. gas, imported predominantly from Russia. Besides, steel and chemical companies of the region traditionally received discounted prices for electricity and gas. In particular, according to the anecdotal evidence some companies in Donbas (e.g. chemical plants affiliated with the representatives of the Party of Regions) were able to secure lower (than imported) prices of natural gas, which resulted in higher deficit of the Naftogaz. During the global economic crisis of 2009 steel companies remained afloat and maintained market share primarily due to high hryvnia depreciation. Even though large share of goods manufactured in Donbas are exported or used locally there were some inter-regional links and it is hard to replace some of them. This primarily relates to commodities and intermediate goods, which are used for producing in particular machine-building products. In particular, over half of coal extracted in the region is used in other oblasts outside Donbas. Inter-regional trade with steel products is also significant. At the same time, contribution of the region to the agriculture is smaller. 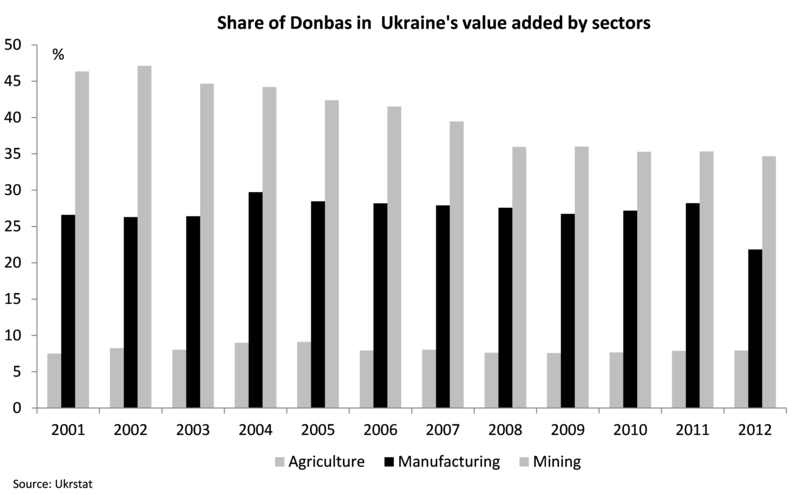 Between 2001 and 2012 Donbas accounted for near 8.0% of gross value added generated in agriculture. Agricultural areas are located in South Donetsk region and north Lugansk region outside the heavily urbanized industrial cluster. This relates to both crop harvest and livestock production. The contribution to other sectors is more or less the same as country average on per capita basis. As Donbas is an industrial region with a high contribution to Ukraine’s GDP there was a widespread belief among residents of the region that they ‘feed’ all Ukraine. However, the impact of the region on public finance is not that straight forward. In particular, while VAT provided around 30% of consolidated fiscal revenues and is the single most important tax, VAT paid by companies in Donbas region remained very low. In particular, VAT payments (net of refunds) in Donetsk oblast accounted for only 0.05% of total VAT revenues in 2011 and 1.2% in 2012. This is explained by the fact that exporters of the oblast received disproportionate amounts of VAT refunds likely due to political influence. Revenues from other sources were largely in compliance with the share of the region in Ukraine’s population. At the same time, there are significant central fiscal transfers to Donbas. In particular, inefficiency of coal mines resulted in enormous subsidies to the coal mining sector. Overall, state aid to the sector was the highest among other sectors of economy at near 1% of GDP. Besides, lack of investments into modernization and security of work in mines resulted in high frequency of accidents in coal mines. This along with high share of former miners with occupational diseases required increasing amounts of financing from the Fund of Insurance in Case of Working Accidents and from the Central budget to the residents of Donbas. Strong lobby allowed for higher privileges provided to miners and former miners. In particular, until recently minimum pension of miners was set at the level of three sizes of statutory minimum pension. As a result, the divisions of the Pension Fund of Donetska and Luhanska oblasts had larger than average deficits on per-capita basis, largely contributing to significant deficit of the Fund. Therefore, mining sector, even though was important for supplying coal, was very inefficient and expensive for public finances. Overall, according to estimates Donbas received from the budget transfers and subsidies that were double its contribution to the public sector. Therefore, while Donbas generated large share of Ukraine’s GDP, it contributed negatively to public finances. The central government of Ukraine lost control over near 3% of the territory in Donbas, including some of largest cities of Donetsk and Luhansk. The Government currently maintains control over part of Donbas industrial cluster between Krasnoarmiysk and Severodonetsk and area around Southern port and industrial city of Mariupol. Most of agricultural land in Donbas is also in government controlled area. As a result of military conflict many companies in the occupied territory either stopped or terminated their operation. In particular, significant portion of installed capacities in steel and chemical industry also stopped working. Some of them were destroyed at least partially, which puts under a question possibilities for their operation in the future even if the military conflict ends. Large part of coal mines either reduced or terminated extraction of the coal. Some mines were flooded and their recovery may be not economically efficient. As a result of disrupted supply chains companies in Mariupol and other controlled cities in Donbas as well as other regions (particularly, in metallurgy) were forced to reduce their operation. This resulted in drop in industrial output by 17.1% in December 2014 and 22.5% in February 2015. According to the National Bank of Ukraine estimated share of Donbas in GDP dropped to 5.6% in the first quarter of 2015 and economic problems of Donbas added over 4 percentage points to drop in GDP in 2014. The impact will be negative in 2015 as well (according to the IER estimates real value added in industry is estimated to decline by 11.3% in 2015). Termination and stoppage of export-oriented companies in the occupied territory significantly contributed to sharp decline in real exports of goods and services. Donbas exports was down by 70% in the last quarter of 2014 (overall, Ukraine’s exports dropped by 14.5% in 2014). The impact will be negative in 2015 as well but low statistical base will mitigate the contribution to exports decline. Loss of export revenues from Donbas was one of the key reasons for hryvnia depreciation in autumn 2014 and in February 2015. This was far from the only reason for dramatic depreciation of hryvnia from around 12 UAH per USD in summer 2014 to 24 UAH per USD in February 2015. At the time hryvnia was also under pressure due to high demand for cash foreign currency and imported goods from population, while international reserves were dangerously low. Still two disruptions in exports from Donbas (in August-September 2014 and February 2015) likely were triggers for surge in pressure on hryvnia. At the same time, the impact of military conflict on the performance of agriculture in Ukraine was rather limited. In particular, favourable weather conditions resulted in record harvest of grains and pulses (more than 64 m t) even without taking into account Crimea and military conflict area in the East of Ukraine. As the central government lost control over part of the Donbas, which is held by rebels, the possibility to collect taxes there also largely ceased. Some companies with interests on both sides of the conflict line still pay taxes but revenues are declining. At the same time, financing liabilities remained high including social and pension payments as well as wage payments. In the end of 2014 the Government of Ukraine took a decision to terminate all social payments to residents of occupied territory, including social welfare payment and pensions, citing security concerns. In particular, to continue receiving pensions retired persons from Donbas should move to the territory of Ukraine, which is controlled by central government. This was expected to have positive impact on fiscal balance and the balance of the Pension Fund. However, over 1 million of 1.2 m retired individuals from the occupied territories re-registered and continue receiving pensions. Besides, appropriation of pensions for 2015 includes full allocation of pensions for pensioners on uncontrolled territories. At the same time, the Government stopped payment of wages and other funding for state entities that did not relocate to controlled areas (around 30-50% of public sector workers did move to controlled territories). Moreover, the Government reduced significantly state aid to coal mining companies as well as revised some privileges to miners. As a result, overall impact on public finances seems to be positive, contributing to lower deficit of central government. At the same time, social costs of military conflict are high. According to the United Nations, the conservative estimate of the total death toll from the conflict reached near 6 000 persons by now. At the same time, the number of internally displaced persons approaches 1 m persons. Actual number may be lower as some residents registered as displaced persons only to receive pensions and other social benefits. Most of them are residents of Donetska and Luhanska oblasts (only 20 thousands persons moved from Crimea). Near 50% of them settled in Kharkivska, Dnipropetrovska and Zaporizhska oblasts, as well as in government-controlled areas of Donetska and Luhanska oblasts. These people lost their property and jobs and their lifestyle. They now require new employment as well as often psychological assistance. This, in particular, increases pressure on labour markets of other regions, which is already high taking into account economic downturn. Moreover, external migration increased. In particular, significant part of residents of Donbas moved to Russia, while others (much smaller part) moved to Belarus and EU countries. The number of asylums in foreign countries is estimated at near 0.7 m persons. This is partially a new wave of brain drain as some companies (in particular, in IT sector) shift their business to other countries and attract there smart Ukrainian employees. Unrest in the Eastern part of Ukraine further negatively contributes to already unfavourable investment climate. This, against the background of high economic uncertainty and vulnerability results in no access of private sector to international capital markets. At the same time, the Government is urged to conduct broad set of reforms, which were delayed over year. However, military conflict is often used by the government as an excuse for not conducting needed reforms. Chances that Ukraine will lose entire Donbas, that is Donetska and Luhanska oblasts, are not very high at least from our perspective. However, there are chances that the central government will not be able to return control over the territory, which is currently held by rebels (including cities of Donbas and Luhansk), in the nearest future. Therefore, the possible impact of this on the economy of Ukraine should be seriously taken by the Government for counterweighting possible negative impact. Overall, the impact might substantially vary for different sectors. Detachment of the part of Donbas, which is currently occupied by rebels, will definitely result in lost gross value added for the country. The impact might be assessed at up to 10% of Ukraine’s GDP taking into accounted losses from disruption in controlled areas. At the same time, the impact will be higher for industrial output but minimal for agriculture. In particular, as the occupied territory hosts the largest industrial plants in Donbas the direct impact on the industrial output could account for near 15-18% of total Ukraine’s industrial output. GDP losses include indirect impact through further disruption of supply chains. This is especially important for mining sector, as Ukraine will de facto lose control over more than half of coal extraction. However, the impact might be twofold. On the one hand, companies in the rest of Ukraine might face higher costs of purchasing coal mines either from mines at the occupied territory or elsewhere. On the other hand, in the longer run they might find better quality of coal at fairer prices from third countries taking into account inefficient production in the mines in the Donbas. This is likely to be true also for other commodities and intermediate goods produced in the occupied territory. The impact on the trade balance will be negative, which might contribute to further hryvnia depreciation. However, this impact will be limited in the future as it had taken already the hardest hit in August-September 2014 and February 2015. The estimation of the impact on public finance in Ukraine is not simple and it depends on the assumption we make behind such calculations. The central fiscal deficit is expected to reduce as the Government will not pay large transfers to coal mining sectors at the occupied territory, which more than counterweight inflow of tax revenues from occupied by rebels area. Transfers to coal miners through high social benefits will also be lower. Moreover, energy consumption will decline as large and inefficient energy consumers in steel and chemical industries remain on the occupied territories, which, in turn, would reduce energy subsidies paid from the State budget to the Naftogaz. As a result, the deficit of the Naftogaz is likely to shrink as well. At the same time, if current status quo in pension payment remains, the impact on the Pension Fund’s budget might be negative as it would still pay pensions to most pensioners in the region but will not receive pension insurance contributions from employees on occupied territory. Still, overall impact on public finances is estimated to be positive with reduced deficit of the general government. It is clear that Ukraine’s economy will reduce by size if occupied territories are not integrated into its economy. However, it is likely to remain strong industrial core. In the short and medium run companies in other regions of Ukraine, that traditionally had enterprises from the occupied territories in their supply chains, are likely to carry losses and will be challenged to find new suppliers of commodities and intermediate goods. However, they will be probably able to find better quality goods at fairer prices in the competitive world market, which would make them also more competitive. Improved situation in public finance is essential at the moment taking into account high deficit of central government. Overall, in the longer run Ukraine’s economy may become stronger and more resilient. To ensure such a favourable outcome the Government should implement broad set of reforms in many areas. In particular, it should introduce fiscal consolidation and anti-corruption measures, implement tax and court system reform. Deregulation would also contribute to improved business climate, which is necessary to attract investments into the country.